A clinical performance from two of the race’s stalwarts Sbonelo Khwela and Thulani Mbanjwa saw the preview-race favourites romp home to the 2018 Non-Stop Dusi Canoe Marathon, presented by Lovemore Brothers & Savunde Accountants on Friday. The Euro Steel pair of Khwela and Mbanjwa dominated from the outset, getting in front as early as the Low-Level Bridge on the outskirts of Pietermaritzburg and never looked back despite the size of their lead fluctuating throughout. It was a sixth Non-Stop win for Khwela and despite his recent dominance of the race Friday’s win did have a first to it. “It’s the first time I’ve won the Non-Stop driving a K2,” a smiling Khwela mentioned. “I’m really happy that the experience that I have gained over the last ten years has paid off in a first K2 win in the front of the boat. 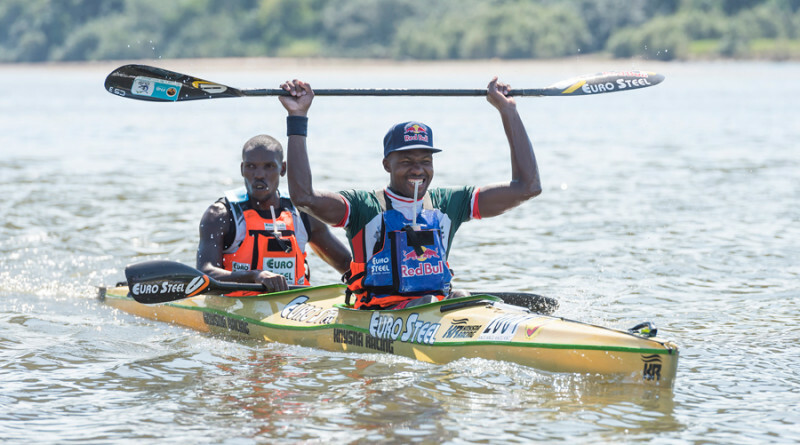 Mbanjwa last won the Non-Stop Dusi in 2015 when he paired up with Nhlanhla Cele to finish the race as the fastest boat, but he and Khwela have combined on a number of occasions in the past. “We only got in the boat together once before today but that wasn’t a problem for us,” the evergreen Mbanjwa said at the finish. “The only difference for us was that I was sitting in the front of the boat for our previous races. As the highly publicised drought continues to put waterways under pressure, paddlers knew that from the Inanda Dam Wall they were going to have to run the majority of the way. For the winning pair, making sure that they had plenty of life left in their legs for the run after the dam wall was one of the only tactical decisions that they made. “Having to run from the dam wall basically all the way to Pump House is always tough, especially on Non-Stop because by the time you get to Inanda Dam your body is finished. Having finished the 2018 FNB Dusi Canoe Marathon in second place, Carl Folscher and Hungarian paddling ace Adrian Boros made it two seconds from two when they finished under five minutes behind the winners. After a frustrating swim while they opted to paddle around the cabbage Tree portage to conserve their legs, they fought back, and on the flatwater dice across Inanda dam they got within three minutes of the race leaders. Finishing in third place was the Change a Life duo of Richard Cele and 2017 winner Mpilo Zondi while the first K1 home was Andrew Houston in just over nine-and-a-half hours.